Les Parfums de Rosine has been one of my favorite niche perfume houses for the past decade, so I always look forward to trying its newest releases. This fall, Rosine has launched Rose des Neiges, "a modern interpretation of a powdery rose" inspired by the image of an unexpected late-autumn snowfall that frosts all the flowers in a rose garden. Rose des Neiges was developed by perfumer Nicholas Bonneville and includes top notes of mandarin, pink pepper, lychee and watermelon; heart notes of rose and white violet; and base notes of sandalwood, ambroxan, heliotrope and musks. "Powdery" is an understatement here: after an introductory touch of bright bergamot, Rose des Neiges is a big soft puff of heliotrope and white musk with pink roses peeking through. You'll either love this one or hate it; I'm a powder-lover, so I can't get enough of Rose des Neiges. (And, to my relief, I couldn't detect the watermelon and lychee notes.) This is Rosine's fluffiest scent, even more so than the creamy confectionery of Ballerina No. 1. It has above-average sillage, like a generous dusting of fancy imported baby powder, and its dry down is a hug of a pale musk with a vanillic finish that lasts for hours on my skin. I do wish Rose des Neiges were a little, well, rose-ier; but even if it's not exactly what I expected, it manages to be good cozy-sweet fun (without feeling juvenile). In a "family tree" of perfumery, Rose des Neiges would be a daughter of Jean-Charles Brosseau Ombre Rose, a niece of Cacharel LouLou, and a cousin of Anna Sui's original fragrance (the one in the black-and-purple bottle) and Ava-Luxe Angel Face. 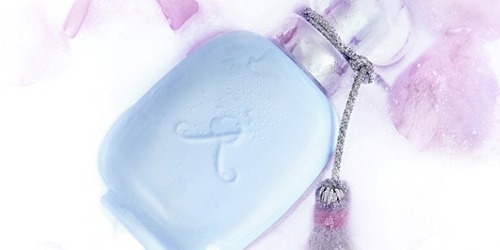 As usual, the packaging is lovely here: Rosine's bottle has been tinted an opaque pale blue — "the color of the sky on a cold morning" — and the silver tassel is meant to suggest frost. Rose des Neiges doesn't actually feel like first snowfall to me; for that, I'd try CB I Hate Perfume Winter 1972 or Black Phoenix Alchemy Lab's Snow White. It's more like an angora sweater or cuddly Persian kitten or a meringue —comforting and frivolous things that you might enjoy indoors on that sparkly, snowy morning. If this sounds like your kind of thing, you should try to curl up with a sample of Rose des Neiges. 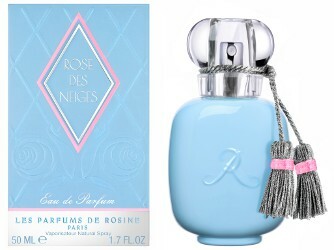 Les Parfums de Rosine Rose des Neiges is available as 50 (€98) and 100 (€130) ml Eau de Parfum. For purchasing information, see the listing for Les Parfums de Rosine under Perfume Houses. Before I even read the entire review the first thought that popped in my mind was Ombre Rose , a fragrance I wore in the late 70s….and then reading your entire review I also saw mention of similarities to Lou Lou (another like of mine that I wore in the late 80s)….I know I would be in the love camp on this one but I am on a no buying so I will just enjoy this fragrance through your lovely review…oh and the bottle is lovely too, especially the gray and pink tassels! I never wore Ombre Rose myself, but I remember smelling it on other women and I love love love the bottle design. And I’ve become a LouLou fan over the years! so yes, I think you might like it. Used to loathe powdery scents, but now I actually enjoy some of them. Not familiar with any of the Rosines, but would like to try this, esp since the watermelon & lychee weren’t detectable to you. Don’t have any blue bottles, but sure would love one! I’m so happy that you write you can’t smell the lychee and watermelon notes, as I was about to write this scent off to sniff..
Powdery fragrances are definitely comfort scents for me!! As a lover of powdery,musky and cosmetic like scents I’m pleased to read to such a nice review of this scent. Thanks,Jessica! I’m a fan of the Rosines as well and it’s good to know they are still making perfumes worthy of some praise. The upcoming cold season is a perfect time for scents like these. I do love perfumes that smell like vintage lipsticks or face powders…you make me feel less alone! I don’t love every single Rosine, but they have far more hits than misses, for me. And that’s rare. I’ve never tried any perfumes from this house but I’d like to. Which would you recommend starting with? Jessica’s the expert, but I really like Rose d’Ecume. And there is a cinnamony one geared toward men that is also very nice. La Rose de Rosine is their original scent, a lovely rose violet with a chypre base. Rose d’Ete is a fun fruity rose. I also love Praline, Ecumenical, and Secret! Um, “Ecume,” not “Ecumenical.” Silly auto-correct. hah! Oh, please try Secrets de Rose! I think it is one of the most beautiful Rose perfumes out there! I’ve only tried 2 Rosines: Rose Praline which I really liked for most of its wear, and one of the Ballerinas which was meh. I do like some powders so long as they don’t smell like J&Js. One day I’ll order some more from this line. I do love that bottle. Thanks for your review! This is more like some Italian or French scented talcum powder that comes in a decorative tin! It’s been a favorite line of mine for so long, for obvious reasons…I’m a creature of habit! Ooh, this sounds like just the sort of thing I’d like. I’d be interested to know whether it bears any resemblance to LV Teint de Neige, which is one of the most well-done powder scents I can think of? Oh! Teint de Neige is one of my true loves. I’ve been wearing it every winter since…um…well, for a long time! To, me Rose des Neiges feels a touch less glamorous (fewer floral notes?) and more snuggly, a bit sweeter — but if you love TdN, I bet you’d appreciate this one too. It’s very well done! This is one POW!dery fragrance and very pretty. To me this smells pure and elegant with a definite suggestion of “clean”,; imagine an expensive, fancy white soap that should only be used with a fine porcelain tray. I didn’t get any fruits either (thankfully!) and I definitely agree that the sillage and staying power is above-average. I slipped the blotter card between the pages of my pocket agenda and now, more than a week later, is still going strong and scenting the pages and the interior of my bag. *POW*dery — I love it! and I’m going to steal your idea, sort of, by spraying some cards and blotters and tucking them into my lingerie drawer and my nightie drawer. Reading through the list of notes when this was still upcoming, I was really looking forward to finding another powdery love to add to my wardrobe. It sounds like Rose des Neiges doesn’t disappoint. I need to get a sample straight away! Thanks for the review, Jessica. Yes! Ignore the list of fruit notes — this is rose with heliotrope/talc/musk, definitely. Very cuddly. Hope you’ll like it! I’m so glad I reviewed this one — I didn’t realize there was this much curiosity about it. Yay! I hope to visit the boutique someday, too. It’s probably not for me as a scent, but I really like the concept and the packaging. I think the ballerina bottles were great, too. Their packaging has always charmed me — classic and “ladylike,” but still fun!